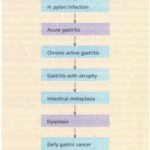 Acute attacks are treated with bowel rest, intravenous fluids and antibiotics, e.g. gentamicin (or a cephalosporin) and metronidazole. Most attacks settle on this regimen, but a few require emergency surgery, which usually consists of a defunctioning colostomy to be followed later by resection. Acute episodes do not necessarily recur and elective surgery is mainly reserved for patients with intestinal obstruction or fistulae. This is such a major problem in the general population that it need not be considered a disease. Most people simply require reassurance and dietary advice. Constipation is common in the elderly, possibly due to immobility and a poor diet. Constipation in young women is common and in some slow transit through the colon has been identified as the cause, whilst some women after childbirth have pelvic floor abnormalities preventing defecation. 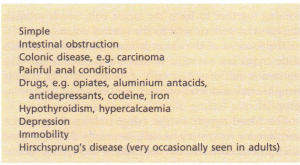 A list of the causes of constipation is given. Most have simple constipation, often due to a low fibre intake. Drugs are a common cause and may need to be stopped. A rectal examination should always be performed. Long-standing constipation does not require investigation, but a change in bowel habit in the middle-aged or elderly requires a barium enema examination. which can be used by the patient, are often useful. 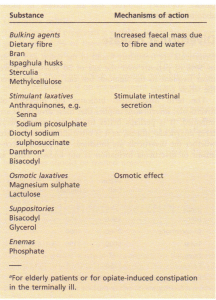 The types of laxatives available are shown . Bulking agents should be tried first. Stimulant laxatives often cause cramp and their long-term use should be avoided as they cause an atonic non-functioning colon. Magnesium sulphate is useful in very severe constipation. The term megacolon is used to describe a number of congenital and acquired conditions in which the colon is dilated. In many instances it is secondary to chronic constipation and in some parts of the world Chagas’ disease is a common cause. but saline wash-outs and manual removal of faeces are sometimes required. This is a rare condition in which multiple gas-filled cysts are found in the submucosa of the intestine, chiefly the colon. The cause is unknown, but many cases are associated with chronic bronchitis and some with peptic ulceration. Patients are usually asymptomatic but abdominal pain and diarrhoea do occur and occasionally the cysts rupture to produce a pneumoperitoneum. This condition is diagnosed on X-ray of the abdomen, barium enema or at sigmoidoscopy when cysts are seen. Treatment is often unnecessary but continuous oxygen therapy will help to disperse the largely nitrogen-containing cysts. Metronidazole may help. 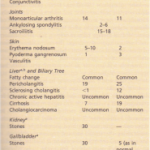 This commonly presents in the older age group (over 50 years) with sudden onset of abdominal pain and the passage of bright red blood with or without diarrhoea. There may be signs of shock and there is sometimes evidence of other cardiovascular disease. This condition has also been described in young women taking the contraceptive pill. On examination, the abdomen is distended and tender. Sigmoidoscopy is normal apart from the presence of blood. Investigations include an abdominal X-ray to exclude perforation. Thumbprinting-a characteristic sign for ischaemic disease-can be seen on a barium enema performed when the patient is well; strictures can also be seen. 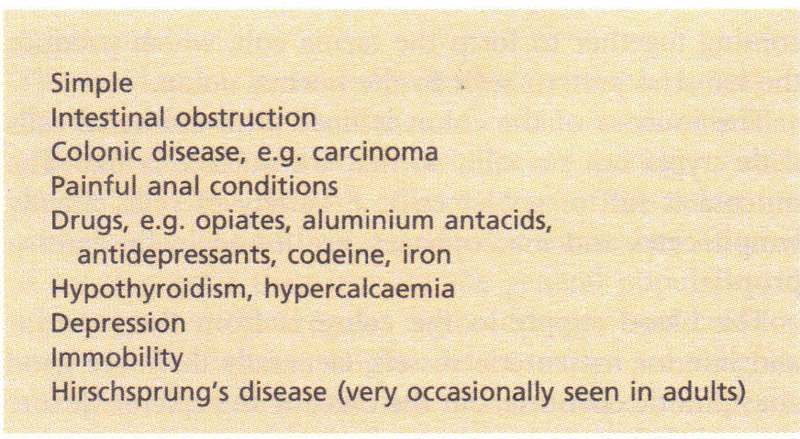 The differential diagnosis is of other causes of acute colitis, but these can usually be excluded on the basis of the sigmoidoscopy findings. Most patients with this condition settle on symptomatic treatment. A few develop gangrene and perforation andrequire urgent surgery. Some develop strictures.